Providing a natural progression in performance and response for advancing students, each Sebastian step-up instrument is handcrafted and painstakingly graduated to enhance performance, and reflects careful adjustment for proper playability. 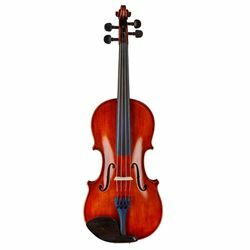 The Sebastian “Paris” step-up violin is fully carved, and features gorgeously flamed one-piece maple back with matching ribs, and finely-grained spruce top, with inlaid purfling and genuine ebony fittings, including distinctive Parisian eye ebony pegs. The superbly figured tonewoods, attention to detail, and beautifully transparent golden brown finish ensure superior performance and contribute to genuine pride of ownership. Each Sebastian step-up violin comes with Knilling approved factory adjustment, D’Addario Prelude steelcore strings, German Aubert One Star model maple bridge, Guarneri model ebony chinrest, and composite tailpiece with four built-in tuners. The outfit includes a deluxe, oblong case with zippered cover with music pocket and storm flaps, locking center latch, padded handle, multiple shoulder strap rings, and adjustable shoulder straps. The semi-French-fitted interior of the cases are fully lined, with matching lined blanket, four bows holders, hygrometer and generous lidded accessory compartment. Outfit includes durable and responsive carbon composite bow with leather thumb grip and wire winding, fully-lined ebony frog with Parisian eye inlay and white horsehair.